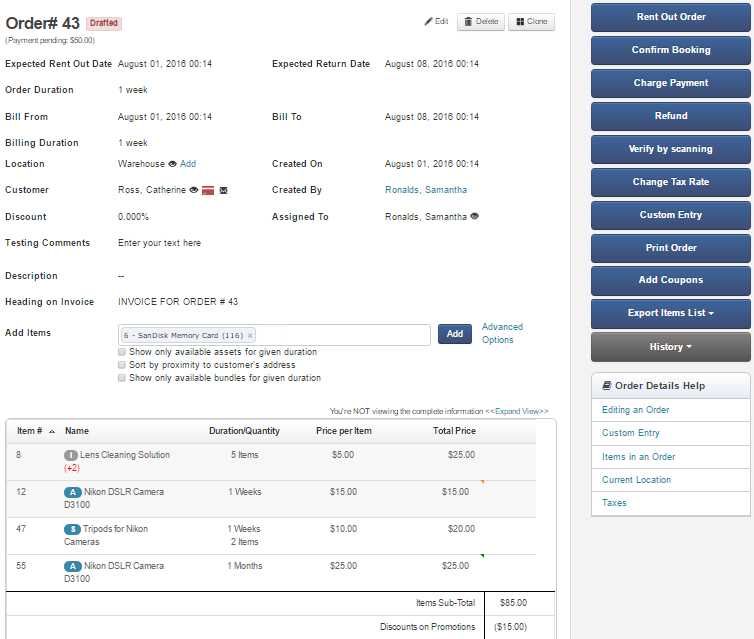 Bundle items together to book and rent out orders with ease and speed. These can be your rental packages, promotions or combination of items that are regularly rented out together. For example a Beach Photoshoot bundle can have 2 DSLR Cameras, 3 Lenses, 2 Tripods and 6 Soda Cans. Explore bundles from your EZRentOut account. Bundles are used to combine different items that are regularly rented out together. For example, if (any) 2 DSLR cameras, 2 tripods and 3 lens cleaning solutions need to be rented out for a ‘beach photoshoot’ engagement, then having this as a bundle will serve both as a checklist and a quick one-step process for their rent out. 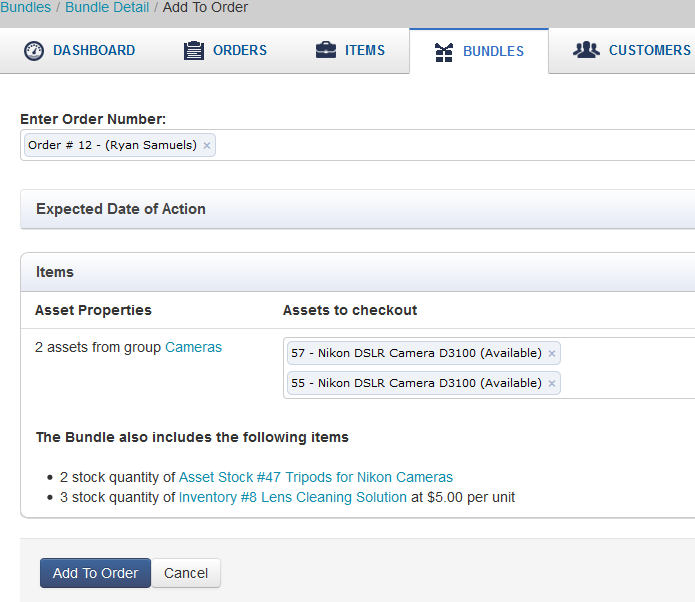 You need to have Inventory and Asset Stock modules enabled to add them in bundle lines. Enable both modules from Settings → Add Ons. – Add Bundle Line: A bundle can have multiple line items based on the types of items needed; based on their name, their association to a group or a number of flexible options presented in the drop-down when choosing the type of bundle line (asset, asset stock, inventory). a. 2 DSLR cameras – We’ve set up our items such that there is a group called Cameras and all DSLR cameras are associated to it. We’ll use the Advanced (Assets) in the type. 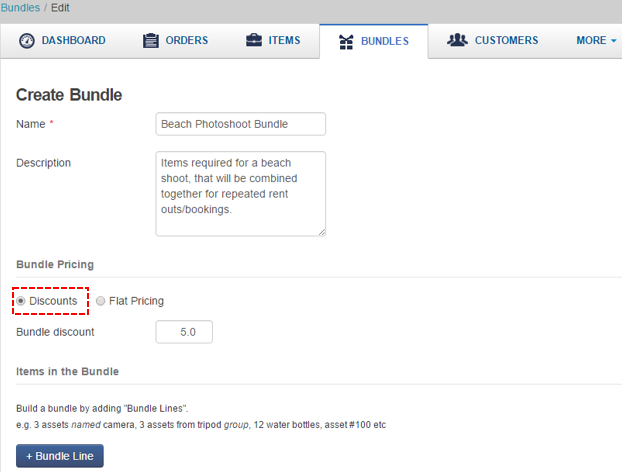 Users can also add Advanced Items to bundles through custom fields. This means that users will be able to look up items based on the custom identifiers that they’ve created. 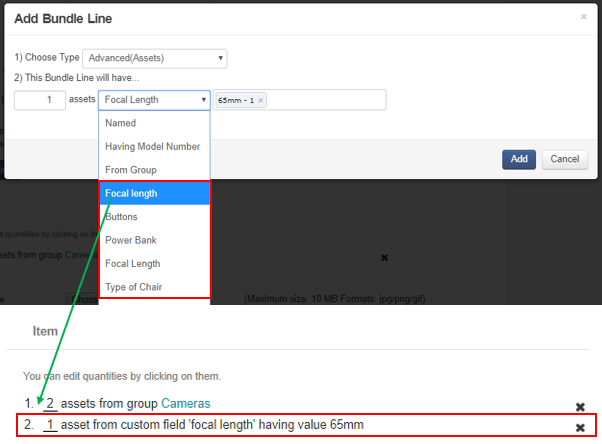 We have extended this functionality to single line text and number fields for items. – Bundle Pricing: For rental items (assets and asset stock), their actual rental rates are used. However, you can have bundle level discounts to override/adjust these rates. For example, a camera is rented out at $5 per hour and $10 per day. If there’s a 5% discount set on the bundle, the rates will change to $4.75 per hour and $9.5 per day. For sale items (inventory), you can choose a price when adding the bundle line. 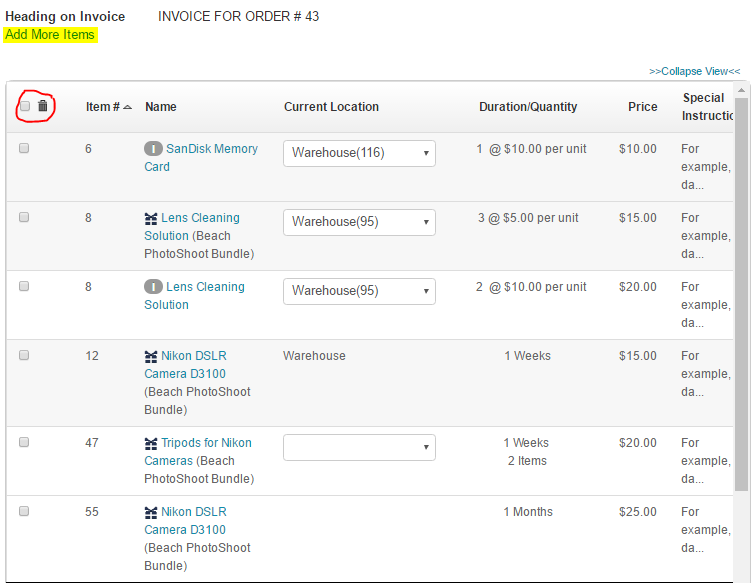 Say you normally sell Lens Cleaning Solutions at $5.5 per set but in a bundle, you want to sell them for $5. You’ll give the $5 price when adding Lens Cleaning Solution in the bundle. Featured Bundle: If enabled, it will be viewable as a featured bundle on your webstore. You will know more about it later in this blog. You can also add comments and upload documents and images to a bundle from within its detail page. Now that the bundle has been created, we can add it to an Order from Bundle Detail Page → Click ‘Add to Order’ button. This action will identify the available assets, asset stock and inventory items from this bundle and add them to your order. Now whenever there is a Photoshoot scheduled, simply add the bundle to the order to rent out or book bundled items. Specified quantities will be pulled up from available items with a single click to be rented out or booked for a Photoshoot (see image below). Learn more about Orders. Booked orders can be edited on the fly. Items (also bundles) can be removed/added, giving businesses more control over their equipment (see image below). Enable the Bookings Module from Settings → Add Ons. You can now book more items at the last minute and update the order. Say you booked a rental order for Ryan Samuels that consists a Nikon DSLR Camera to cover a CES exhibition but then you realized you forgot to add the tripod. You can also enable conflict free booking from Settings → Add Ons → Bookings. If you have more questions on this feature, do write to us at info@ezrentout.com. Add your suggestions at our User Community Forum. Join in the conversation about equipment rental software with us on Twitter @EZRentOut or interact with us on our Facebook Page. This entry was posted in [Support], Feature, productivity and tagged bundle line items, bundles, orders by admin. Bookmark the permalink.